Visits: 60725 persons viewed this recipe. Appam or Palappam – one of the favorite breakfast of Keralites. Jewish people who migrated to India introduced this food item in the country. It is now popular in South India and Sri Lanka. Palappam is generally known as “appam”. Dissolve yeast in 1 cup of warm water along with sugar and let sit for 30 minutes until it is frothy (make sure that the water is not too hot). Mix 3 table spoon rice flour with 3 cups of water and boil for 4 minutes by stirring it. Keep aside and let it cool. Keep it overnight (8 hours) in a warm place for fermentation. Heat an appam pan (round-bottomed cooking vessel) on a medium flame. Stir the batter and pour a ladle (thavi) full of batter to the pan. Lift the pan from the stove and spread the batter by rotating it so that a thin layer of the batter sticks to the sides of the appam pan. Cover the pan with its lid and cook it for 2 minutes on a medium flame (cook one side only). Repeat the previous steps to make more palappams. Serve it hot with any gravy type curry. 1) Each time you take the batter from the vessel to prepare appam, stir well. 2) As the batter quantity increases during fermentation, use a vessel which can hold almost double the quantity. Hi Vasantha, Thanks for visiting this website and I hope you find it informative. 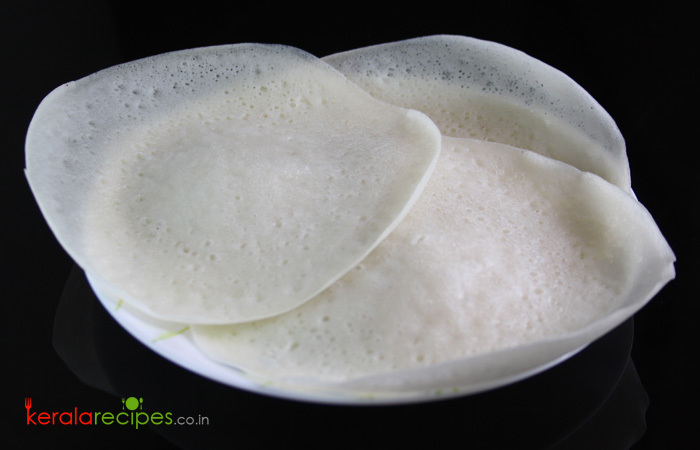 Appam goes well with veg/non-veg stews, egg roast, chicken curry, mutton curry, mixed veg curry etc. Thank you. I am going to try appam recipe. I have tried other recipes but haven’t turned out good. So will let you know. Avial recipe turned out so good. Thank you very much for trying my recipes and also for leaving your feedback here. Nice to know that the Avial tuned out good for you. Please let me know the challenges you faced in other recipes. Thanks. Oh I forgot onion vada turned out superb. Hi Shobana, Thanks a lot for the feedback. Nice to know that Onion Vada came out well for you. How to make appam with rice instead of rice floor. Thanks in advance. Neethu, It is simple, soak the raw rice for minimum 4 hours. Grind it into a smooth paste by adding coconut milk. Combine it with other ingredients and continue the above steps. Some mistakes here… plz read it carefully shan… & modify it. (measurement of cocunut oil…. & step 2… 3 tbl spn or 3 cup rice flour??? Hi Sumayya, Thanks for the comment. We are not using coconut oil in this recipe, I think by mistake you read coconut milk as coconut oil. Regarding the quantity of rice flour in step 2, it is 3 table spoon only. Please not that, step 2 is not the step describing the batter preparation of appam. I request you to go through all the steps. Hi Shaan, I tried appam and it comes out well… thank you… will you pls post how to prepare pressure cooker cake without using oven. Shefeena, Nice to know that the ‘appam’ came out well for you. I am sorry, I have not yet tried baking cake in pressure cooker. But I will try it and post it in the near future. Thanks for the comment. Nice appam. I tried it. Divya, Thanks for the feedback. Nice to know that you enjoyed it. Hi Shaan, can you please let me know the substitute for yeast in this recipe? Saritha, You can use toddy (kallu) as an alternative for yeast. Nisha, Thanks for trying this recipe and also for the feedback. Hi shaan, have tried most of the recipes. Turned out Good. Instead of yeast and kallu you can use the coconut water from inside the coconut. Use this instead of water. Follow as per the rest of the recipe. You won’t go wrong. Sakuntala, It is pleasure to know that you have tried many recipes from this website and it turned out well. Thank you very much for sharing the tip and also for taking time to share your feedback. Thank u so much. It is really a useful recipe. I successfully done it . You are welcome Sherna, thanks for the feedback. Always I am confused while making palappam. Your recipe solved all my confusions and I tried your palappam and came nice. Thanks a lot. Cooking is My Passion. Please try to include more veg recipes becoz I am a pure vegetarian. Sreevidya, Thanks a lot for such a wonderful feedback It is pleasure to know that this palappam recipe solved all you confusions and you love cooking very much. I will try to include more veg recipes soon. Sir, what is the substitute we can use in place of yeast in appam. Moon, You can use Palm Toddy (in Kerala it is called Kallu) as an alternative for yeast. For appam I tried soaked rice grinding in mixer but you have used roasted rice flour. Shall I use raw rice flour or is it a must to roast the rice flour. Krishnakumar, The method you mentioned also work out fine. But for crispy appams we need to use roasted rice flour. Hello, I am from Pune, Maharashtra ,great fan of Kerala cooking and your blog. We don’t get roasted rice flour, can I use normal rice flour, or could you please share a recipe with raw rice, thanks! Kirti, you can use raw rice floor also, but adjust the water level. Roasted rice floor is used to make it more crispy. Thanks for the feedback. I tried this recipe something went wrong. Is it because I tried making appam in frying pan because I don’t have appachatti. The batter was not so runny too. Rosemary, It is not because of the pan or appachatti. May be because of the water level in it or the batter is not fermented well. Hope it will work out next time. Thanks for the feedback. Hi Shaan, I want to know the recipe for one type of pathiri which I used to get from tea shops in kozhikode. I browsed as much as I can bt couldn’t get the original recipe. pls upload if u can. Hi Shaan, thanks for the appam recipe. Could you give us the quantity for one or two cups of rice. As a bachelor I want to cook small quantities. What is your cup size. Is it 200 or 250 ml? Please tell me how to make roasted rice flour. Is it using raw rice? Recently I tried appam soaking rice for 8 hours and grinding in a mixie along with the yeast. It was a disaster next day. Thanks again. Anil, I used 250 ml cup. If you want to cook small quantity I suggest you to take the half of the ingredients mentioned in the recipe. You will get the roasted rice flour in most of the grocery shops. You can also make by socking the raw rice in water, drain it well, powder it using a mixer grinder, then roast it in the pan. Thanks for the comment. I liked the recipe very much. One interesting detail I read that “Jewish people introduced it”. Counter intuitive to imagine people from Arab region used to have rice dishes. Hi, Could you please tell me which kind of rice flour can be used for this appam? Sreekutty, use raw rice (Pachari) flour. It is available in most of the Indian supper markets. Thanks.